In the Santa Ana Sweets Kitchen we create small batch, hand crafted, chocolate dipped caramels using only the finest ingredients without artificial additives or preservatives. Our buttery smooth golden caramels are hand dipped in luscious dark chocolate and sprinkled with sea salt to heighten your delight. Our caramels do not contain preservatives, so for best shelf life we recommend that you enjoy them immediately or keep them up to 6 months in the refrigerator. Because we hand craft in small batches we ask that you provide a desired delivery date so we can provide you the freshest caramels possible. At Santa Ana Sweets we love happy customers. We’ll refund or replace any product that you’re not completely happy with. Need Special Rush Shipping and Fulfillment? Call to arrange pick up or hand delivery. Chewy, tasting delights that burst a series of delights in your mouth. I love how the chocolate and caramel and salts sparkle with flavor in my mouth with each bite. They are an “OMG” new tasting experience over multiple chews. The perfect gift for the one you love and for friends you surely want to delight with moments of flavor that stop time. YUMMY! Want a delight for your taste buds? Try Chef Ricks gastronomical delight in the form of chocolate covered caramels that will literally melt in your mouth. I have had the luxury of both enjoying these personally and for the past two years have given to my Clients in the form of a year-end thank you. If you are someone that enjoys the savory treats of life, try Santa Ana Sweets Salted Chocolate Covered Caramels. Then only share with those you love!! Santa Ana Sweets Salted Chocolate Covered Caramels are simply amazing. These are true artisan chocolates and if you haven’t had the opportunity to try them you are missing out. These are so good. Sometimes when I think of caramel I think of something chewy. These are more like melt-in-your mouth caramels. Absolutely delish and the chocolate and sea salt go together so well. Heaven in my mouth. Wish I could eat more but I gotta watch my calorie intake. It makes a great gift. These caramels are absolutely delicious and are the perfect gift! They come in a nice box and everyone I’ve given them to has loved them. Much better than a regular old box of chocolates. You will love these! Offered some of these delicious caramels to my client and before I could give him the box he said he had the best caramels already. My client then proceeded to pull out a box of Chef Ricks Santa Ana Sweets Chocolates! We both raved about the perfect blend of caramel, chocolate and sea salt as we shared each others boxes of caramels. I am not usually a huge fan of caramel because they are too hard and stick in my teeth. Chef Rick eliminated that excuse and I am very thankful what a tender and wonderful flavor. On Valentines Day I will be giving several Boxes of the New Heart Gift Boxes to friends and family which makes me look like a hero. Thanks Chef Rick. Amazing sweet and salted chocolate covered caramels, great as business or personal gifts. 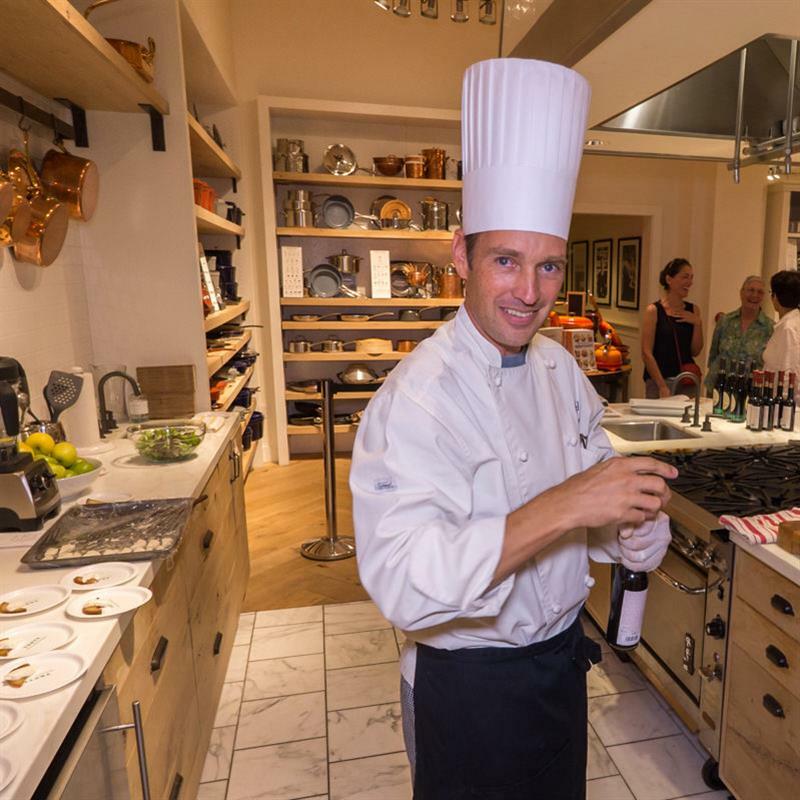 Thank you chef Rick! 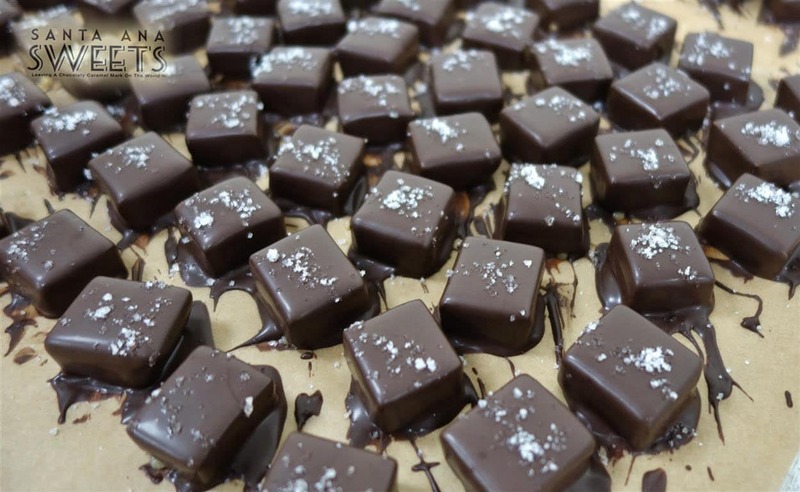 Chef Rick’s salted chocolate covered caramels are delicious, beautifully packaged and sure to please. One bite and you will be in chocolate heaven! I will be keeping a few on hand to give to family, friends and special clients. My new favorite sweet! I love these more than all the commercial and designer brands combined. For the holidays I gave my very picky family members each a box. It was the first time they actually appreciated the gift and didn’t return it! So now I have a perfectly sweet and decadent go to gift for all Life’s special occasions, including; Valentine’s Day, Birthdays, Showers, Graduation, Congratulations, Get Well Soon, Encouragement, Friendship, Just Because, etc. A-mazing! It’s the best way to describe the caramels. I gave Chef Rick’s caramels as gifts to clients and business partners over the holidays and everyone loved them. After the first sample I tasted, I was in love. I purchased 10 boxes for clients. That night, I started to crave one and had to break open a box for my own. There are soooo delicious. You take a bite and the caramel just melts in your mouth, as the hint of sea salt and chocolate blend for an incredible flavor. Great with a bottle of Cabernet Sauvignon. Needless to say I am hooked. Chef Rick doesn’t disappoint !! He performed an intimate dinner, in my home, for my wife and I, for our anniversary . . . a great surprise for her and a wonderful and tasteful service to both of us. When you layer on top . . . the ultimate quality caramels that he served us that day . . . and ones I have since purchased to treat my clients . . . he offers the complete package ! Chef Rick is the consummate professional who OBVIOUSLY loves his work !! The proof is in the “pudding” . . . so to speak! !